A common practice among students is to vape in the bathroom stalls. The vape is the new take on cigarettes. How is Stroudsburg High School administration coping with students vaping at school? The answer is a new vaping policy. Vaping is the use of an electronic cigarette or similar device to create and inhale/exhale a vapor. 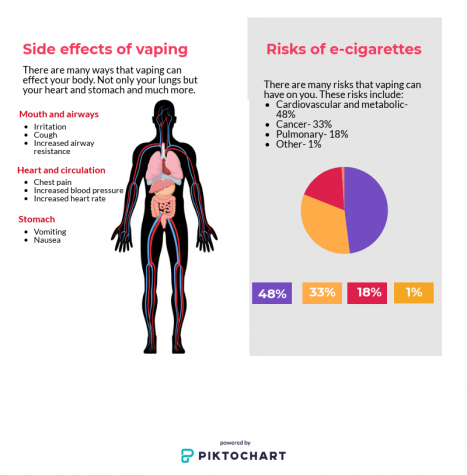 Although it’s generally accepted that e-cigarettes are safer than smoking cigarettes, a growing body of research indicates that they in fact lead to negative health consequences. Used for a high, it generates the feeling of smoking, even though it’s not the same. Vaping requires what’s commonly called “e-juice”. It includes propylene glycol, vegetable glycerin, any added flavorings, and, most of the time, nicotine. 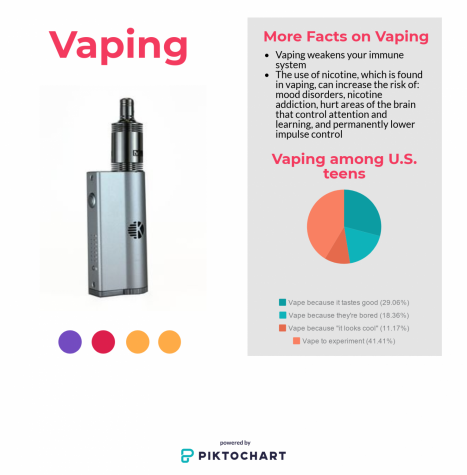 Since E-cigarettes have been provided in the United States since 2007, there isn’t much time given to view statistics on the long term effects of vaping. However, this doesn’t mean long term effects aren’t possible. Short term effects include addiction, mental ability affects, and possible lung issues. For cigarette users attempting to overcome addiction, vaping has been known to help. There are approximately 600 ingredients in cigarettes compared to the four ingredients in E-cigarettes, but e-cigarettes are still not recommended to minors and/or people not already addicted to cigarettes. Therefore, students may be penalized up to the degree of expulsion and referral for prosecution. There are other possible penalties listed in the Controlled Substances/Paraphernalia policy, such as drug counseling and rehabilitation. “I don’t believe students are seeing the dangers we see,” said Sodl. There are certain limits to this policy, including limiting its enforcement to school grounds and school activities. The times and places students may be subject to punishments for vaping by the Stroudsburg School District include, stated in School Board policy 227, the time period when a student is going to, at, or coming from school or a school activity. The policy prohibits possession of vaping equipment on school grounds, not just the use of it. To continue, students carrying vaping equipment to use off school grounds may be disciplined equally to the catch of using the equipment on district property. To view the Vaping Policy, click on the link here, go to “Policies”, and then go to the 200 Pupils category and scroll down for policy 227.1. I feel like the vaping policy can be more strict than it is now especially for everyone”s health and there also might be people that can not tolerate the smell. 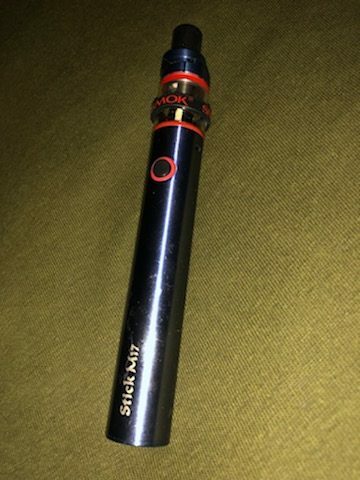 I also feel that kids should take it a little more serious and really think about the effect and after math of vaping and also think about, what is the point of doing this and what is it gonna do for me in the long run. The SASD vaping policy has been in effect for about a month. Since the policy has been enacted, many changes in the school have occurred. The administration has locked and removed doors on bathrooms, and school security on school lavatories has increased. As a result, many students have trouble accessing bathrooms, and some even claim that their rights are being violated as a result of the vaping policy. “It is understandable that the staff is trying to crack down on the students vaping in the bathrooms, but those of us that have no interest in that sort of thing feel that it is quite a disturbance that we have to walk all around the school to find an open bathroom, or when we finally do find one the doors are taken off,” said junior Collin West. However, many students feel that the policy is important to implement, since so many students vape and don’t get caught. Many SHS staff claim that the vaping policy is necessary to implement as well. “I believe that putting the policy in the student handbook will be a positive in the long run,” said English teacher Ms. Ashley Krause. There are even some parents who have gotten involved in the vaping policy, heavily supporting it. Many parents believe that vaping has negative side effects, and that it’s important for high school students to be positive role models for younger children in the SASD school district. “I wouldn’t feel comfortable knowing my high school child is around peers who may influence him to believe that it is okay, and that there is no harm in vaping, while he has a younger elementary level sibling that thinks everything he does and says is cool,” says high school parent Angelina Thompson. Young people who vape in their early teens are more likely to smoke later on in their life according to the CDC (Center for Disease Control). Most e-cigarettes are highly addictive and can harm adolescent brain development. I’ve walked in on people vaping in the school bathrooms before, but I must say these occurrences haven’t happened since they started locking bathroom doors and taking some off. This new policy certainly works to an extent. 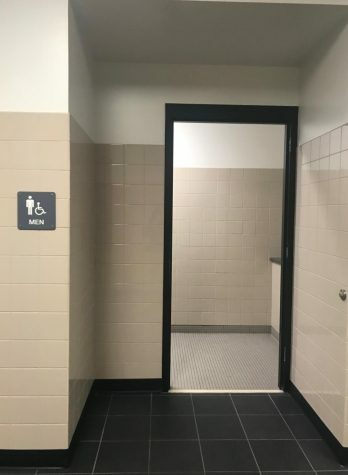 I personally feel they should just remove the doors off of every bathroom instead of just leaving it locked creating an inconvenience for many students.